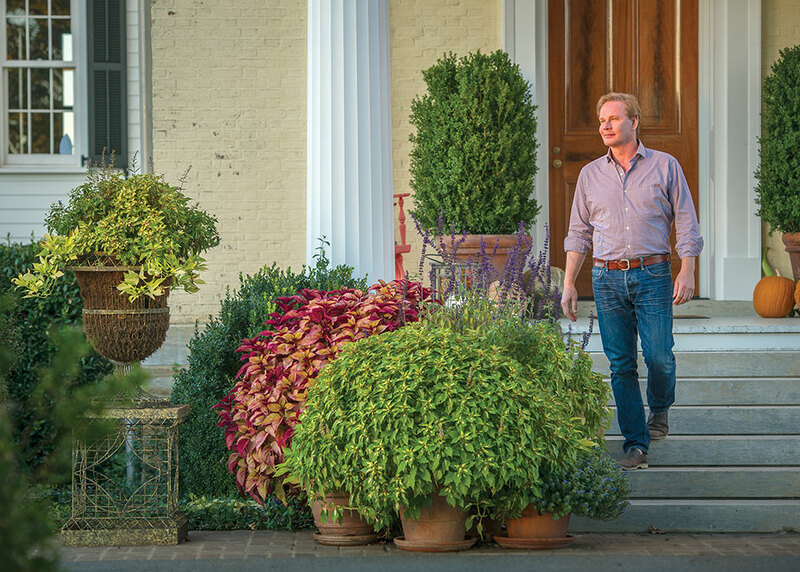 Even though summer has just begun, gardeners need to start planning for fall foliage and blooms. Above Photo: Coleus is a colorful foliage plant that you can grow in containers and flower beds. It will thrive in both sun and shade. Summer is here, and while I’m excited about the bounty and beauty the season brings, I know autumn is close behind. We gardeners have to always think a season ahead. There’s so much to do this time of year, I often don’t take the opportunity to savor the season. Autumn offers a second chance to enjoy my garden — reborn in a new wave of vibrant colors. Fall also can be a spectacular time with the right plant selections. 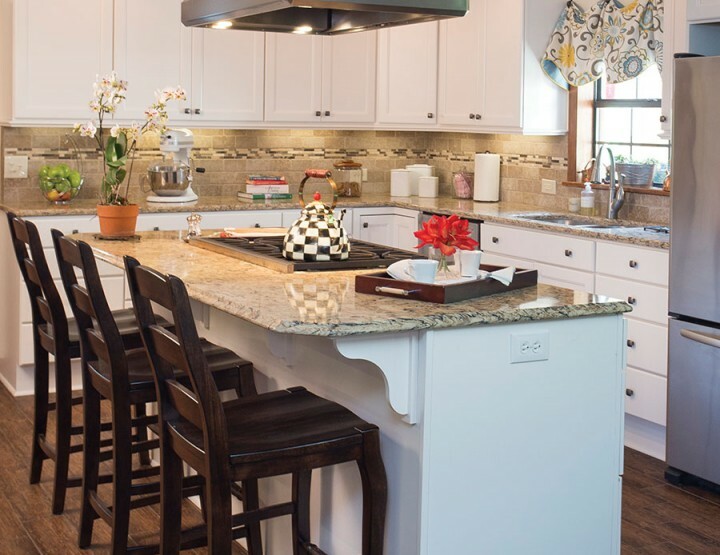 Think about color combination as well as hardiness in cooler temperatures. My spring garden is a tapestry of pinks, soft blues, chartreuse, lavenders and creams. By fall, the blooms and foliage transform into deep purples, oranges, reds, yellows and earthy hues of rust, gold and sage. So what should you plant now for fall color? Consider a mix of perennials, shrubs, ornamental grasses and annuals that will be showy until the first frost. Sow Celosia spicata seeds this month for late summer and fall blooms. I love how the flower plumes mimic those of Purple Fountain Grass. Shrubs are perfect for fall foliage and blooms. 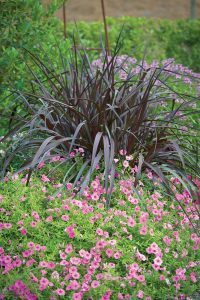 They provide a variety of fall and winter color combinations after summer gardens have faded. Their colorful autumn foliage creates a strong focal point that serves as a visual hook, a place to rest the eyes before taking in the surrounding landscape. For instance, Tiny Wine® Ninebark (Physocarpus opulifolious) delivers richly hued foliage that will last the entire season, with pink and white blooms appearing in late spring. Another favorite, Handsome Devil™ Viburnum has glossy leaves in deep tones of red, orange and burgundy that add sophistication to the landscape or containers. Viburnum is an excellent screening hedge. If you love roses, Knock Out® Roses are great for fall blooms. One sure way to have lots of color is with perennials. Perennials are wonderful for overlapping blooms from one season to the next, to keep flowering into the early fall. They’re also a good investment because they bloom year after year. Mixing and matching compatible varieties that bloom during different stages of the season will bring the color you want. I’ve used ‘Cat’s Meow’ Catmint (Nepeta faassenii) for years. The grey-green foliage forms a dense mound almost twice as wide as it is tall. 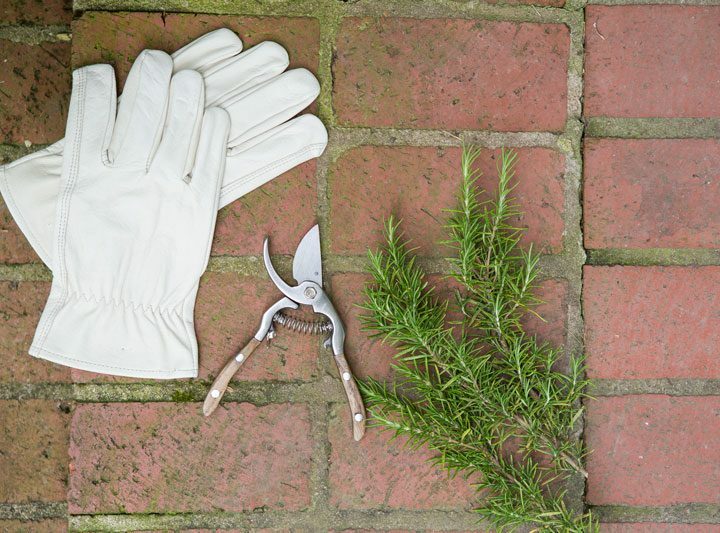 For fall flowers, shear the plants after the first bloom in summer. Don’t overlook direct sow seeds such as sunflowers, gourds or mini pumpkins for rich yellows and oranges. Supertunia® Vista Bubblegum® Petunia is an annual flower that is showy from spring until the first autumn frost. 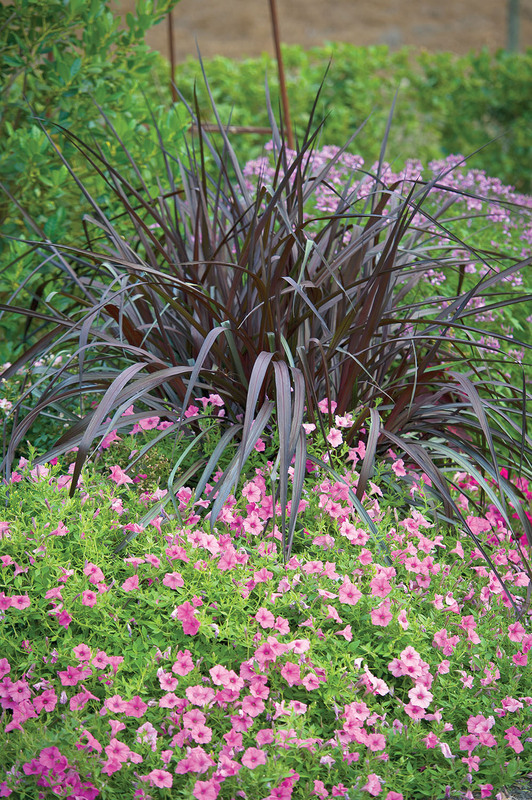 Pair it with Vertigo® Purple Fountain Grass to create a combo that steps outside the usual fall color palette. No fall garden is complete without ornamental grasses. Ornamental grasses come in a wide range of shapes and sizes, everything from the small sea urchin fescue all the way up to one of my favorites, ‘Cheyenne Sky’ Switch Grass (Panicum virgatum). This variety of switch grass changes color with the season. In summer, the blue-green foliage turns wine red. 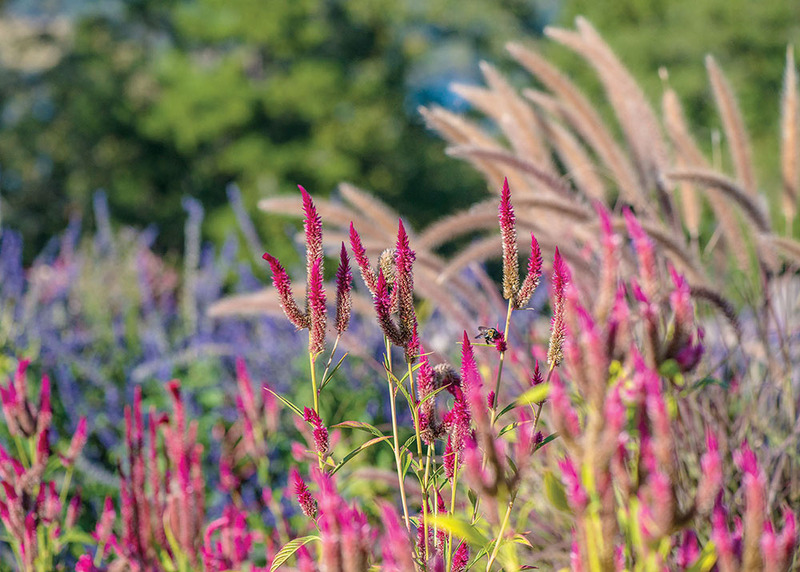 By the beginning of fall, the entire clump is drenched in colorful, deep purple flower panicles. When planting, make sure the bed or container is deeply cultivated, at least 36 inches, to give the root systems room to grow. This helps increase their drought tolerance. Think contrasting textures with ornamental grasses. 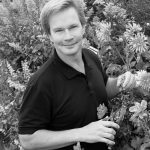 It’s just a matter of taking plants with fine, delicate foliage and mixing them with big, bold flowers or foliage. Annuals are great for early fall. Plant them now, so they will be colorful until the first frost. Two annuals with autumn themed colors are ColorBlaze® Keystone Kopper™ Coleus. The latter’s vivid, copper foliage rivals any bloom in a fall landscape, and Luscious® Bananarama Lantana will give you a heaping helping of saturated yellow blooms. Remember to cut back annuals in late summer, if they get leggy. This will keep them filled out and blooming. 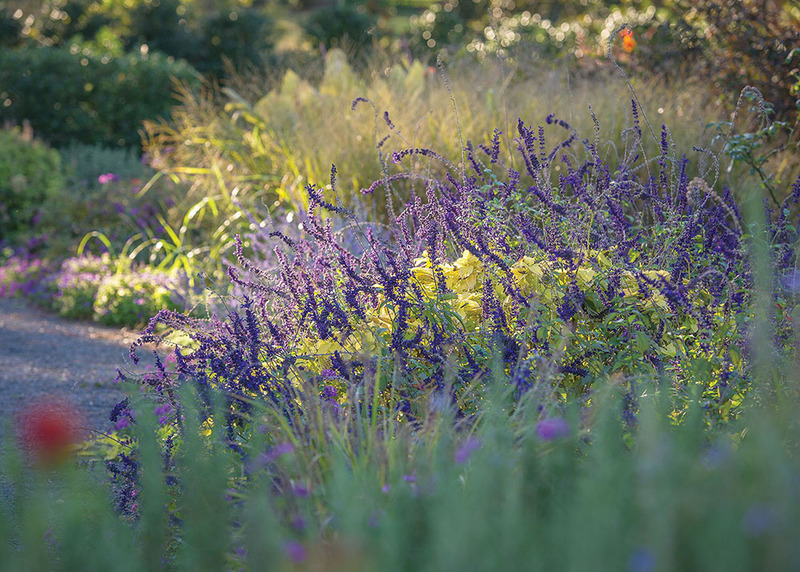 If you love purple, autumn should be your favorite seasons in the garden. From asters to salvias to dahlias, there are many purple beauties from which to choose. It’s a fantastic color to mix with chartreuse. To make sure your new plants will go the distance and make it to autumn, provide them with healthy soil and water. Healthy soil has a loose structure that allows for the free movement of water and air and is alive with microorganisms and plant nutrients. Fertilize when the soil is moist and water thoroughly afterward. If it is possible to work nutrients into the soil without disturbing the roots too much, do so. I recommend choosing an organic product. Remember to follow the manufacturer’s instructions when applying any type of fertilizer. Also a deep-soaking watering is preferable to frequent, light watering. You can also keep moisture just right in the soil by applying a generous layer of mulch around your plants. You won’t believe what just 2 inches of mulch will do. I’ve found early morning is the best time to water my garden. If you water during the heat of the day, moisture tends to evaporate before plants can soak up an adequate amount. Caring for your plants doesn’t have to be a precise science. But with a little attention, your plants will be happy and ready to shine when summer transitions to fall.